The Free Economic Society of Russia issued the 210th issue of Transactions of the Free Economic Society of Russia. - E.N. Yalunina "Competitiveness of a retail organization as the driving force of the agro-industrial complex" . The Transaction of VEO of Russia have been published since 1765. Since 2003, upon the decision of the Presidium of the Higher Attestation Commission of the Ministry of Education of the Russian Federation, the Transactions of the Free Economic Society of Russia have been included in the List of Leading Scientific Journals and Periodicals issued in the Russian Federation where the key scientific results of theses submitted for a doctor’s or candidate’s degree must be published. 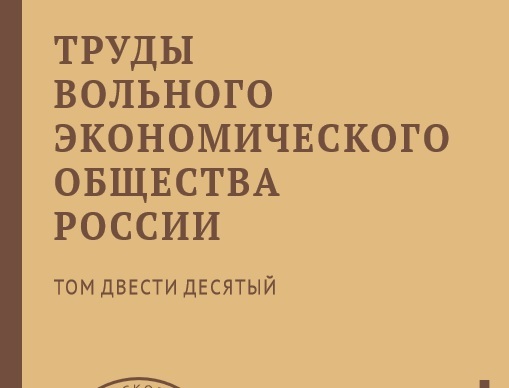 "Scientific works of the Free Economic Society of Russia" are presented in the system of the Russian Scientific Citation Index (RSCI) and the scientific electronic library elibrary.ru . Editor-in-chief of the Transactions of the Free Economic Society of Russia is the chairman of the Senate (Council of Elders) of the VEO of Russia, Honorary President of VEO of Russia, Chairman of the Coordinating Council of the International Union of Economists, Academician of the Russian Academy of Natural Sciences, Doctor of Economics, Professor G. Popov. The editorial board includes well-known Russian and foreign specialists, doctors of economic sciences. The 210th issue of the Transactions of the Free Economic Society of Russia is available here.